What is the background of the Passover controversy at the Council of Nicaea and the situation after it? The Council of Nicaea was an international council of religious leaders from the Eastern and Western Churches, held at Nicaea in Asia Minor in 325 A.D.
under the leadership of the Roman Emperor Constantine. The major issues on the agenda, discussed during the Council, were fixing the date of the Passover Communion and dealing with Arianism that denied the Trinity. Especially, the matter of determining the date of the Passover Communion had been disputed since the mid-second century, and it was brought to an end when the Passover was completely abolished at the Council of Nicaea. The Passover controversy started after all the apostles died and the Early Church was divided into the Eastern Church and the Western Church. The Eastern Church, which was governed by the patriarch of Constantinople in Asia Minor, and the Western Church, which was ruled by the Pope from Rome, celebrated the Passover to commemorate the death of Christ on different dates from each other. The Eastern Church held the Passover Communion on the 14th day of the first month in the sacred calendar and celebrated the Day of Resurrection on the first Sunday after the Feast of Unleavened Bread (the 15th day of the first month in the sacred calendar), according to the teachings of the Bible. On the other hand, the Western Church did not celebrate the Passover, and instead held Communion at Easter. Why did the Eastern and Western Churches celebrate the Eucharist on different dates? It was because the Western Church changed the date of the Lord's Supper at its own discretion, emphasizing the resurrection of Jesus. This difference in date caused much confusion among the Christians traveling from east to west. When they traveled to Rome after celebrating the Passover and the Feast of Unleavened Bread, they became confused and surprised to see the Eastern Church holding Communion at Easter. In the Old Testament, there is the Feast of Firstfruits when the Israelites brought to the priest a sheaf of the first grain (fruit) they harvested and the priest presented it to God as a wave offering on the day after the Sabbath (on Sunday) following the Feast of Unleavened Bread. Until they gave the offering of the firstfruits to God, they could not eat grain from the new crop (Leviticus 23). The prophecy of this feast was fulfilled by Jesus: After celebrating the Passover Supper, Jesus was crucified on the cross at the Feast of Unleavened Bread—the day after the Passover, and He rose from death on the day following the Sabbath (Mk 16:9). By resurrecting as the firstfruits of those who had fallen asleep, Jesus fulfilled the prophecy concerning the first grain—the offering of the Feast of First fruits in the Old Testament (Mt 27:50-53; 1 Co 15:20). According to these Bible-based teachings, the Early Church kept the Passover on the 14th day of the first month in the sacred calendar, celebrated the Feast of Unleavened Bread by fasting on the 15th day of the same month, and observed Resurrection Day to commemorate the resurrection of Christ. The Council of Nicaea decided in favour of celebrating the resurrection on the first Sunday that comes 15 days after the vernal equinox every year, under the excuse that it was difficult to calculate the date of the feast according to the movements of the moon, and determined that Holy Communion should be celebrated at Easter. The Western Church had not kept the Passover till then, but it continued to celebrate the resurrection on the Sunday after the Passover. So, even though the Eastern and Western Churches held the Eucharist on different dates from each other, they all used the Passover in determining the date of Easter. However, as the Council of Nicaea established the date of Easter as the first Sunday after the full moon following the vernal equinox, the meaning of the Passover completely disappeared. Church history simply explains that the Council of Nicaea was convened to standardize the date of Easter. However, behind it was hidden a conspiracy to completely abolish the Passover. Satan's hindrance did not stop here. The Church of Rome, which had been associated with polytheistic traditions and ideas for a long time, introduced Easter that was originally a festival in honor of Eastre the goddess of spring—which was celebrated in Northern Europe at the vernal equinox, and grafted it into Christianity. The custom of eating eggs on Easter originated from the ancient people who believed in pagan gods. As the Church of Rome began to celebrate the Eucharist on Easter day instead of celebrating the Passover, Polycarp, Bishop of the Church of Smyrna, and Pope Anicetus, Bishop of the Church of Rome, disputed over the Passover around 155 A.D. Polycarp emphasized that the Passover was a traditional custom handed down from Jesus, saying that he had been celebrating the Passover every year, together with John—one of Jesus' disciples—and many other apostles. In this dispute, however, they failed to persuade each other. Afterward, around 197 A.D., Victor the Bishop of Rome insisted that the churches should adopt the Roman practice of celebrating Easter instead of the Passover, and compelled all the churches to accept the Dominical Rule. The churches in the West agreed to follow the Dominical Rule, but the churches in the East which were the foundation of the Christian Church greatly opposed his insistence. Especially, Polycrates, Bishop of the Church of Ephesus, sent a letter to Victor, in which he strongly emphasized that the Passover should be celebrated. 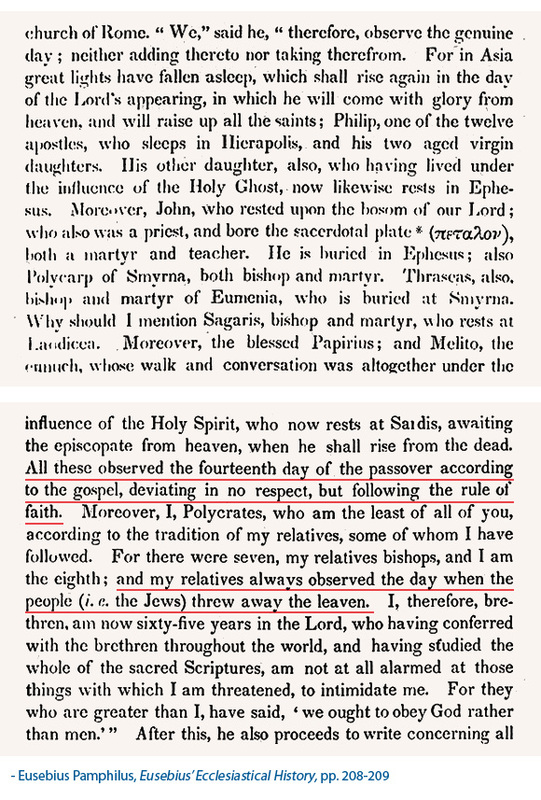 Through the letter which Polycrates sent to Victor at that time, we can guess the situation where the truth gradually started to become perverted after the Early Church. When Victor received this letter, he planned to excommunicate all the churches in Asia and the nearby churches by accusing them of being"non-Orthodox." However, he could not achieve his plan because of objections from many churches around him. The Eastern Church continuously celebrated the Passover according to the teachings of Jesus and the traditions of the apostles. This is evidence that the Passover was not abolished even in the New Testament. The Passover is the feast of life which Jesus established with bread and wine, in order to fulfill His words:"Unless you eat the flesh of the Son of Man and drink his blood, you have no life in you" (Jn 6:53). The Council of Nicaea is very suggestive in many aspects. Because of the intervention of Emperor Constantine, the Church of Rome came to have much stronger authority and started to exercise great influence over the churches. If any church did not submit to the Roman Church that was supported by the power of the emperor, it was regarded as heretical and persecuted. In this situation, the saints who tried to live according to God's word had to celebrate the Passover in secret, wandering in deserts, mountains and caves. However, as the Bible said,"The Ancient of Days came and pronounced judgment in favor of the saints of the Most High, and the time came when they possessed the kingdom" (Da 7:22), Christ—the Ancient of Days—came the second time and the truth of life which had been taken away by Satan was restored in its due time. We have received the promise of eternal life through the Passover of the new covenant which God established. God restored the Passover by sacrificing Himself even to the point of death. It is because no one can receive the forgiveness of sins and salvation without the Passover. Giving thanks for the grace of God who has restored the Passover through His sacrifice and love, we should preach this precious message of life more powerfully.